There are patterns here in the partaking of the fruit: self, then family, then others; self, then the righteous, then the wicked; self, then one’s people, then others. Enos later repeats this pattern in his great prayer. I don’t think this pattern lends credence to an egoistic (or even a growing enlightened self-interest) interpretation, however; quite the opposite. The first fruits of enlightenment seem to be to recognize that I am not a mere individual, that my own salvation is never enough. When pursuing righteousness, we seem to be made ever more aware of the centrality of others who at first glance appear to be different or separate from me. Rather than a growing awareness that others matter to my self-interest, it seems to be a growing awareness that others matter to my self, together with an awareness that we’re all of the same divine family. If we bracket the surreality of dreams, then we get an interesting insight into knowledge here as well. Each time Lehi searches for or actively takes note of something, something else is disclosed to his view. Looking for his family and how he might bring them to the tree makes him aware of the river. Searching for Laman and Lemuel, he notices the rod of iron, which brings into view the path, which brings into view the spacious field, which brings into view the grand fact that the world is not merely Lehi and his family, but numberless concourses of people. This seems to reinforce the point about egoism: if we remain wrapped up in our own self-interest, we miss the whole world; we miss our whole self. Why do Laman and Lemuel not come when Lehi beckons them? Critically, the text is silent on this matter. It notes that they “would not,” which implies agency—it was a chosen act not to come. The fact that we’re quick to attribute sin or rebelliousness or lack of faith to them, however, is evidence that Nephi’s narrative has already worked to great effect on our understanding. A plausible reason from their perspective is that they saw other things themselves, things that Lehi could not see but which they deemed worthy of pursuit. The dream is wonderfully rich in what it lays out; but the dream also makes clear that there are other paths, and it does not necessarily condemn these, even if it is clear that one thing is more desirable than all else. Finally, notice that the waters—later interpreted by Nephi as having a similar meaning as the tree itself—are near the tree. Waters nourish the tree, and the tree turns the water into desirable fruit. This is the way of all things lovely, virtuous or praiseworthy or of good report. They are never single. They are interconnected and reinforcing. Once again: pursuing one good always leads to a related other. your comments about “self” makes a good point and reminds me of how, when we’re on an airplane about to depart, go through the safety routines and how the stewardess reminds us, that in an emergency, we must put the mask on ourselves first before helping others. 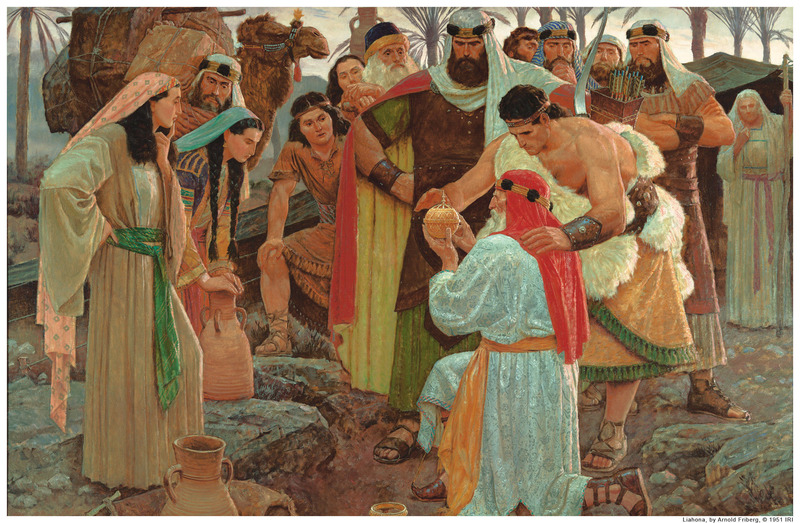 I also appreciate your thoughts on Nephi’s dream about the the tree of life and how quick we are to attribute Laman and Lemuel’s choices to sin. If I remember in other merkabah and related texts the waters come out of the tree. They aren’t nourishing it but the world. BTW – know I’m getting ahead of things. But comparing Nephi’s vision to some of the main Enoch texts is fascinating. Lots of similar geography type presentations. I suspect it applies to Lehi as well. I used to have a binder on all the parallels I halfway thought of writing up one day but lost it in a basement flood about 8 years ago.